Mushrooms capers & oysters Potting To Pott Beef Take a good buttock of beef or a leg of mutton piece it in pieces & season it wth. savory spice an ounce of salt peter 1/2 a pt. of clarret yn. having 3 or 4 pd. 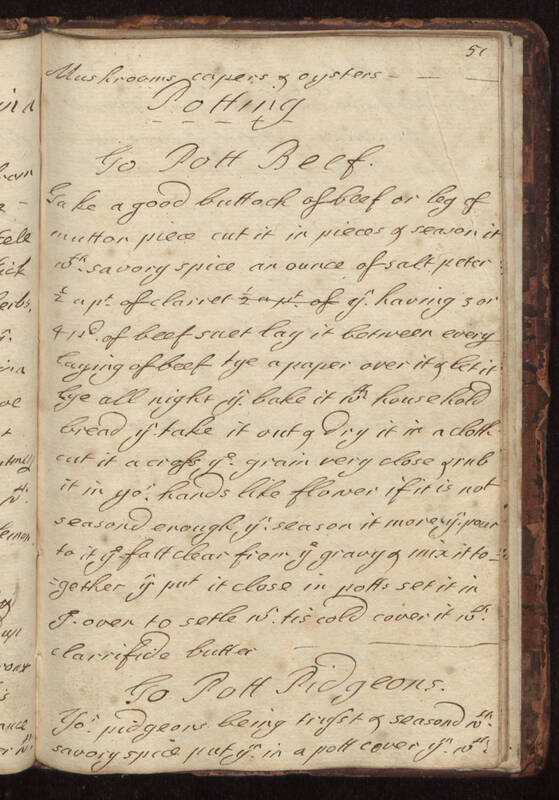 of beef suet lay it between every laying of beef tye a paper over it & let it lye all night yn. bake it wth. household bread yn. take it out & dry it in cloth cut in a cross ye. grain very close & rub it in yor. hands like flower if it is not seasond enough yn. season it more yn. pour to it ye. fatt clear from ye. gravy & mix it together yn. put it close in potts set it in ye. oven to setle wn. tis cold cover it wth. clarrifide butter To Pott Pidgeons. Yor. pidgeons being [tryst?] & seasond wth. savory spice put ym. in a pott cover ym. wth.